What’s that mysterious perturbation on the water surface on the right? 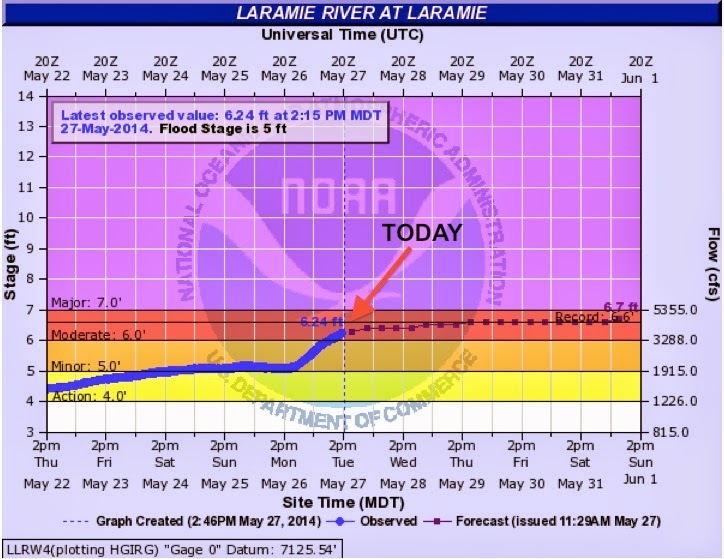 The Laramie River is a mighty river now -- not just a wimpy little plains stream. It’s officially in moderate flood, and will rise even higher soon. The days are warm and the snow in the mountains is melting fast. Maybe you thought the bench in the first photo was Rich’s bench -- it’s not. It’s Kayla’s bench, nearby on higher ground. Rich’s bench is at the tip of the red arrow in the first photo. and now today -- just a minor perturbation on the surface of the water. Kayla's in bench in lower right corner; Rich's bench in center. My cottonwood tree used to be accessible by land. Now one needs a boat. It’s standing on an island between the river channel and an overflow stream. River channel on right, overflow on left, my tree in center. 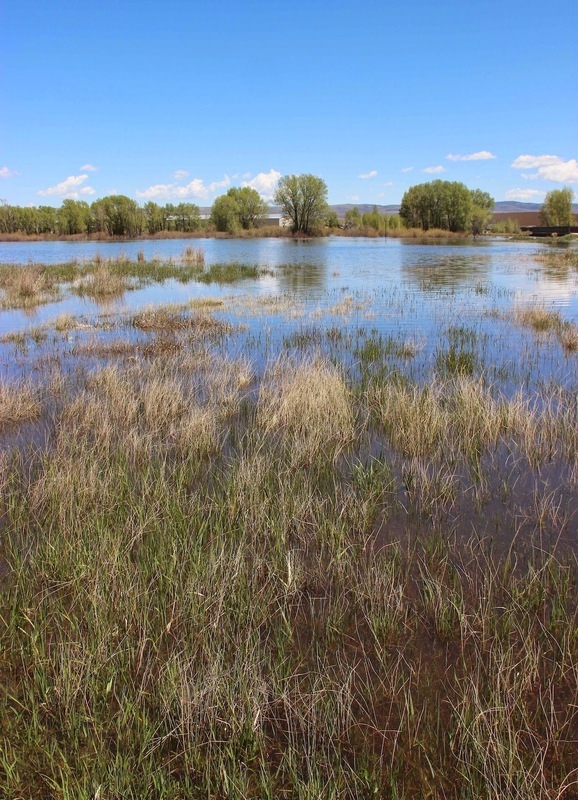 The river has taken over large areas of low land, as it often does in spring. 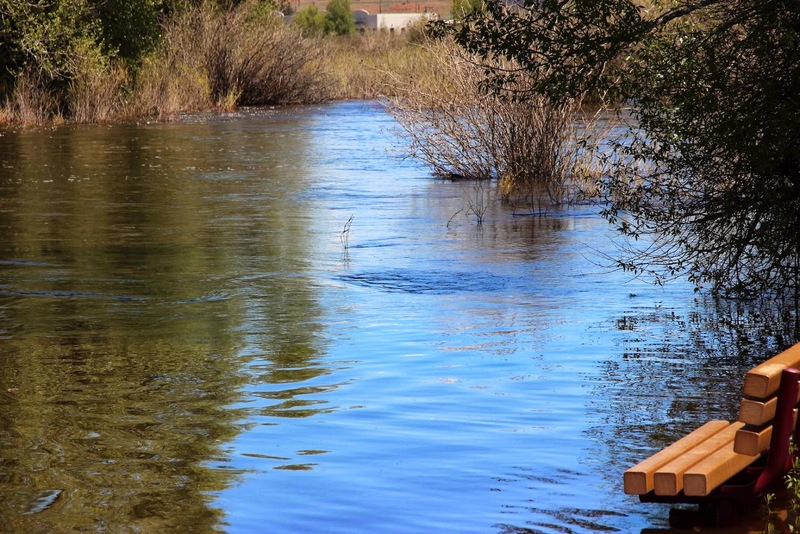 I like it when the river floods -- it makes my neighborhood seem a little bit wild. I like watching its changing form. Ducks and shorebirds show up to take advantage of the overflow, and the beaver are out more, not sure why. Maybe they like it when parts of the walking/biking path are underwater and people stay away. A few times I’ve seen beavers munching on the soft herbaceous plants that grow along the edge of the path -- like evening primroses and dandelions. 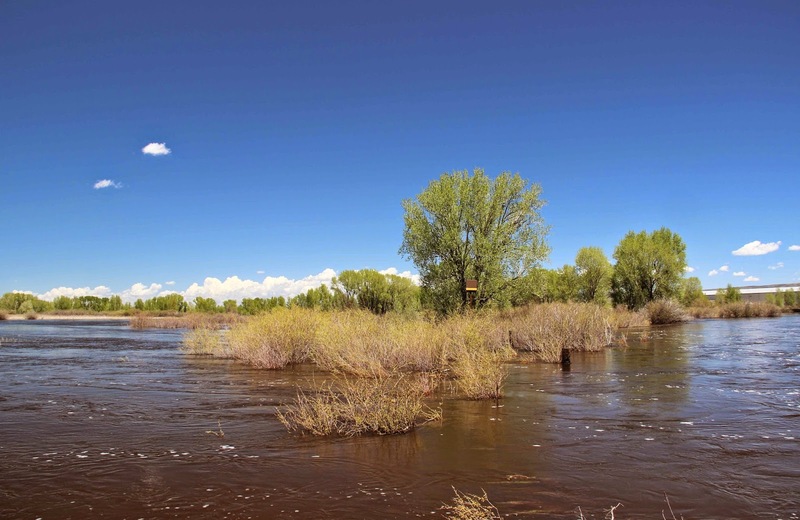 I like it when the Laramie River flows swift and full, as it's doing now. It even drowns out the sound of trucks on the highway a short distance west! That's a real river. This news really belongs in my June tree-following report. But I couldn’t wait -- it’s too exciting! Check the post of June 8 for more. there a shadow growing longer now, and nipping at my heels. ... 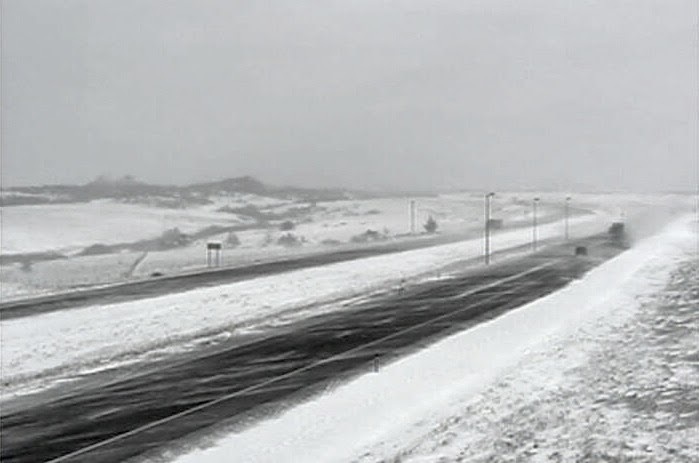 IF the highway is open. 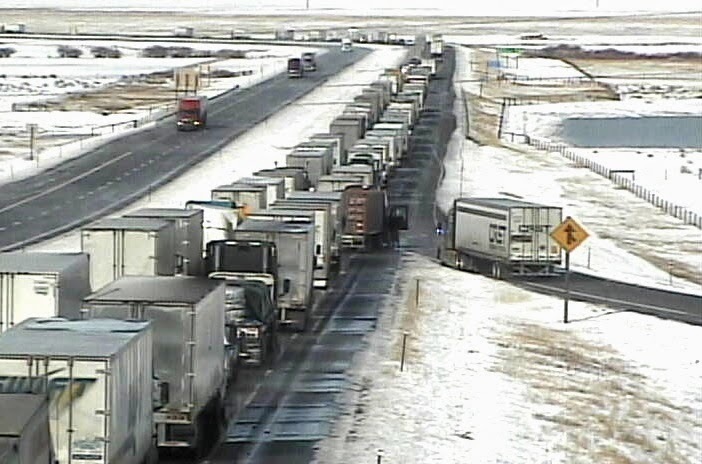 Interstate 80 is open and trucks are again on the move, after being stuck in Laramie, Wyoming. Laramie was founded in 1868 during construction of the First Transcontinental Railroad. Back then our government was visionary about infrastructure (and lining pockets of influential citizens). A railroad spanning the country would be built! The Central Pacific started in Sacramento, California and worked east, while the Union Pacific worked west from Omaha, Nebraska. The companies didn’t just build, they raced. They would be paid by the mile and the rates were good, so the more miles they could cover before the two lines met, the more money they would make. 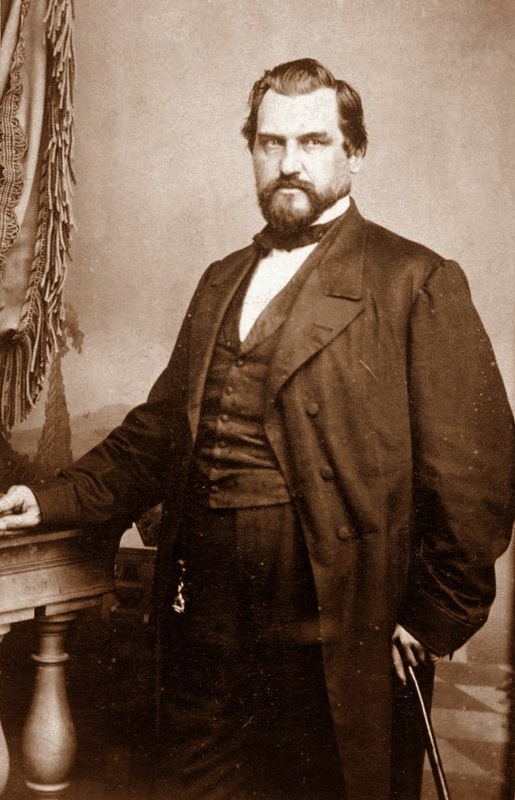 Leland Stanford -- California governor, US Senator, railroad magnate (Central Pacific), and eponymous benefactor of my Alma Mater; source. The Central Pacific had to struggle across California’s Sierra Nevada almost immediately. Then they sped across the Great Basin after Stanford met with Brigham Young and secured crews of Mormon laborers. The Union Pacific made good progress across the Great Plains but then faced the challenge of the Rocky Mountains. 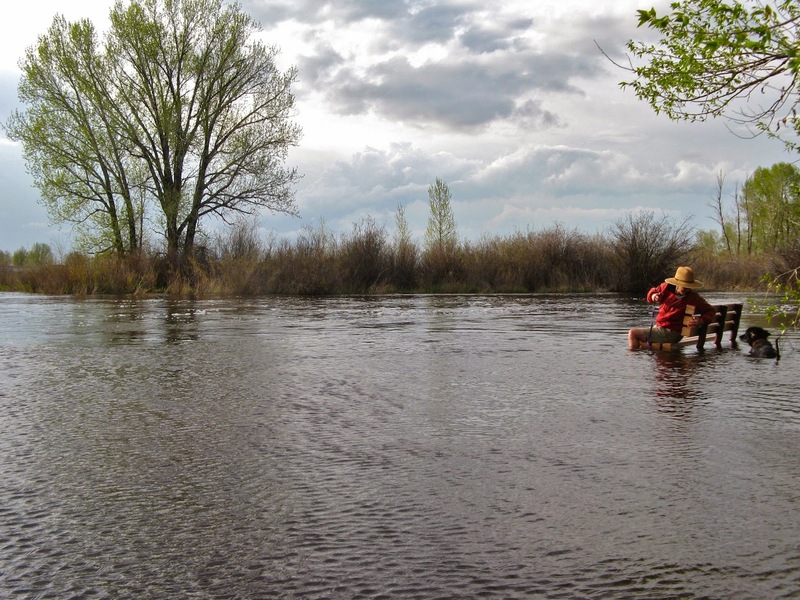 Fortunately surveyors had found a relatively easy way across -- a long gradual grade rising from the Great Plains to the summit of the Laramie Mountains. They called it The Gangplank. Click on image to view details (in 1867, the Laramie Mountains were called the Black Hills); source. 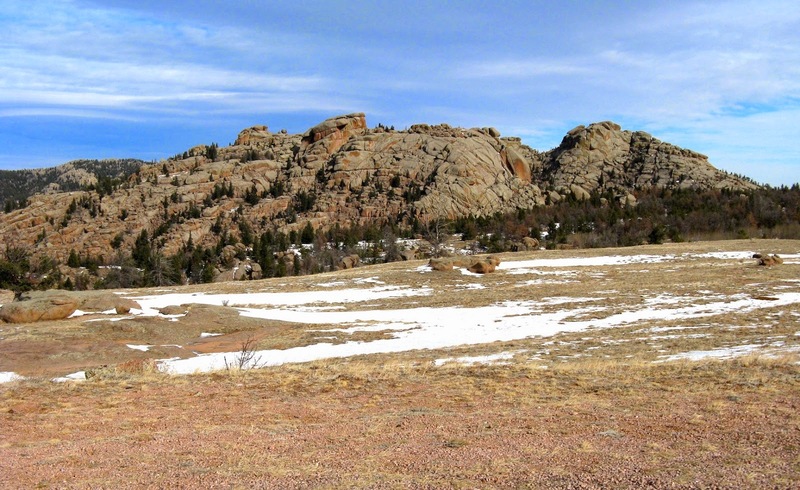 From the crest of the Laramie Mountains the route wound down to the Laramie Basin. The railroad camp there was named Laramie as well. The first train arrived on May 10, 1868, and the next day the line was closed by a snowstorm. Even so, the new town grew to a population of 2000 within two weeks, with most of its citizens arriving by train (source). 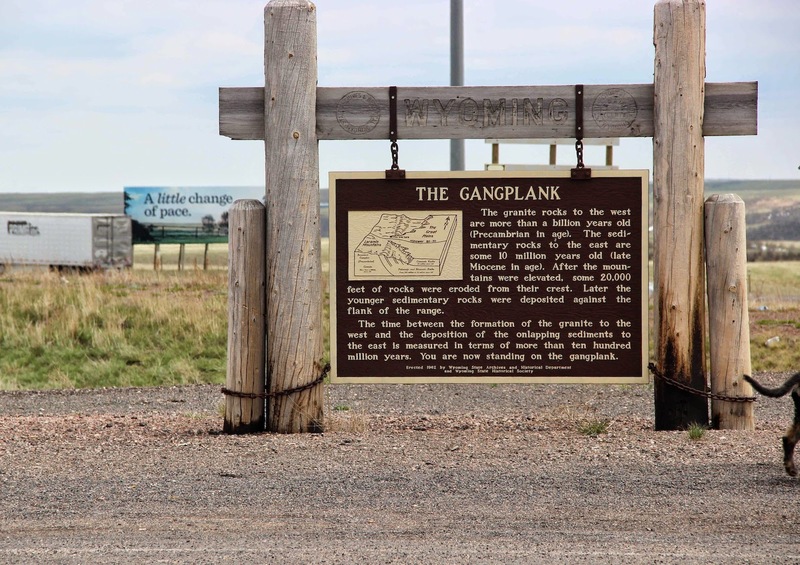 Laramie is where it is because of the railroad, and the railroad is where it is because of the Gangplank ... but why is there a Gangplank? For that answer, we move into the realm of geological time. In fact we could go back over a billion years to when North America was significantly smaller, but growing as pieces of continents collided with the southern coast, including one not far from Laramie. 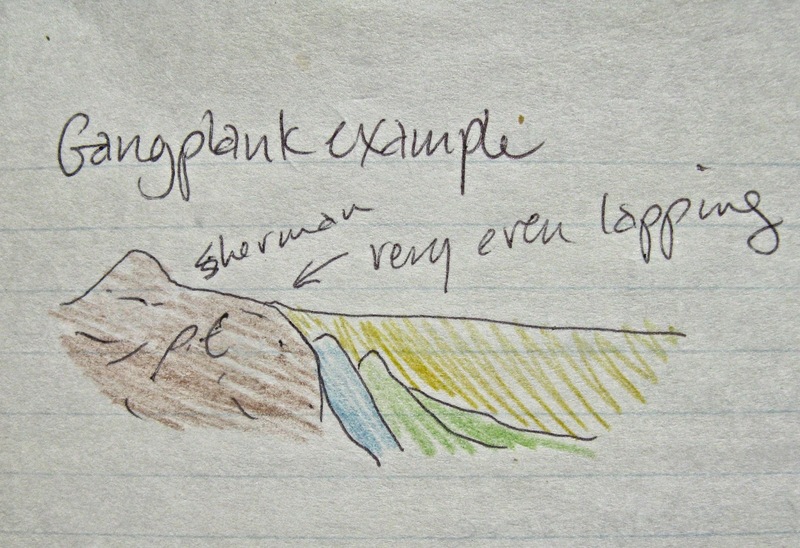 But it would take quite a few blog posts to get from that Precambrian collision to the creation of the Gangplank. We could go back just 60 million years to the uplift of the Laramie Mountains, but that story is too complicated, puzzling and long to include here. So let’s go back a mere ten million years, to “just yesterday” geologically speaking. 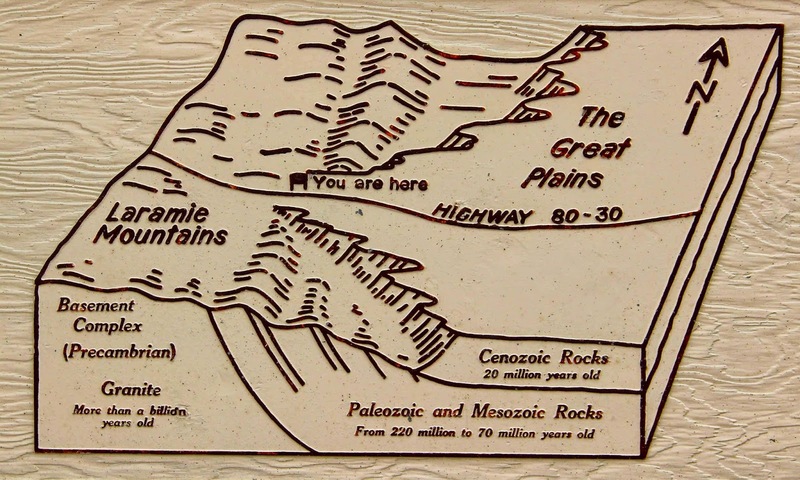 Ten million years ago the Laramie Mountains had been mountains for at least 50 million years. But like all mountains, they were worn down from the get-go ... even as they were being uplifted. Eroded debris was deposited on the flanks for tens of millions of years, eventually burying most of the range. Block diagrams by B. Mears, Jr., after S.H. Knight; Advanced Geomorphology, U. Wyoming, 1984. If we had visited the Laramie Mountains ten million years ago, we would have seen small rocky mountains atop long slopes rising from the Great Plains. The granite peaks at the crest of the range probably never were buried, and remained exposed during Oligocene-Miocene times. Another of Doc Knight's block diagrams, now an interpretive sign along I-80. Ten million year old sedimentary rocks lap evenly onto 1.4 billion year old Sherman granite. A. Answer the questions in your own words, and to the best of your ability. Over a billion (I read the sign). The Sherman granite is on the order of 1.4 billion years old, emplaced after a continental fragment collided with the south coast of North America (see Frost et al. 1999). 2. What does erosion mean? Bonus: B. Post a photo of yourself in the parking lot with the either the plains, the granite rocks, or the informational sign in the background. The pavement does not have to be included in your photo. Here I am by the sign. The sloping surface of the Gangplank shows nicely on the horizon. Why am I here? because an English botanist recently posted about EarthCaches. 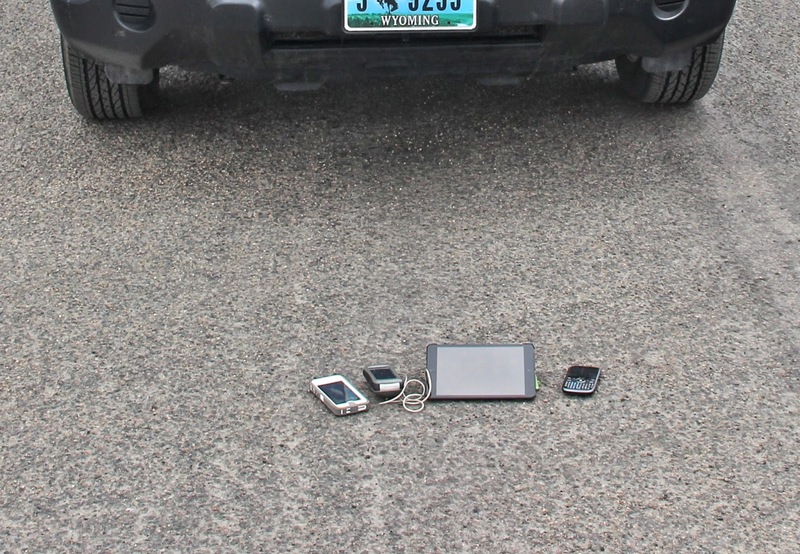 Though not required, here’s a photo of the pavement with tools of modern day explorers. We had plenty of cold weather this winter, with several visiting arctic air masses and a decent amount of snow. 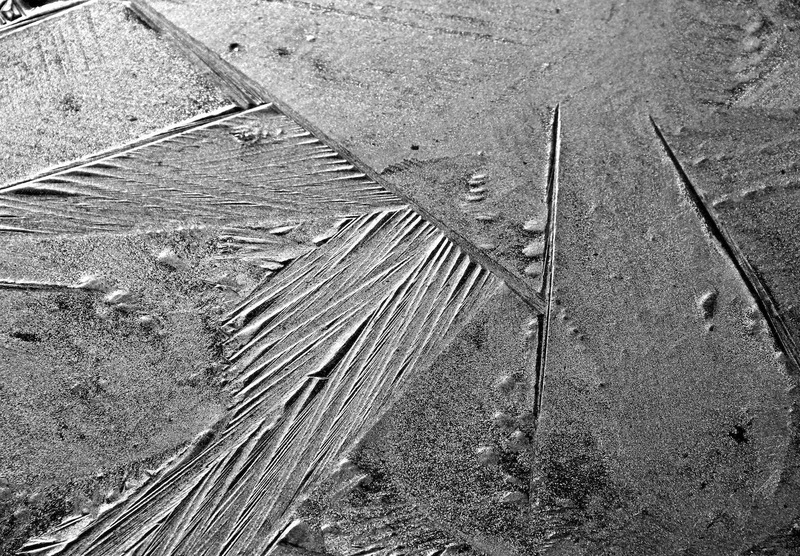 But somehow I let winter pass without any posts about ice art. Yesterday there was one more opportunity. 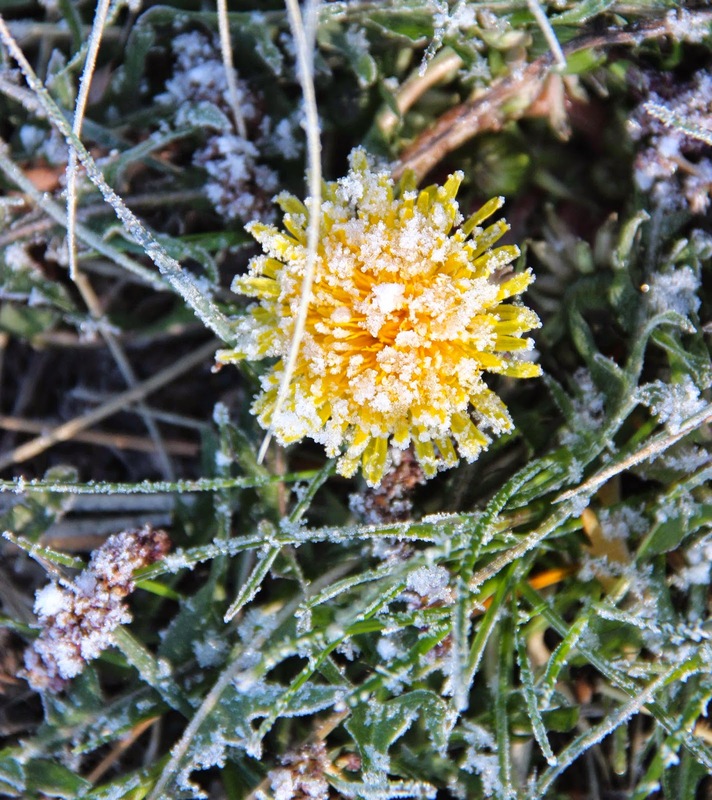 Temps dropped to 10º F early in the morning and that brought Jack Frost back out of retirement for one more exhibition. 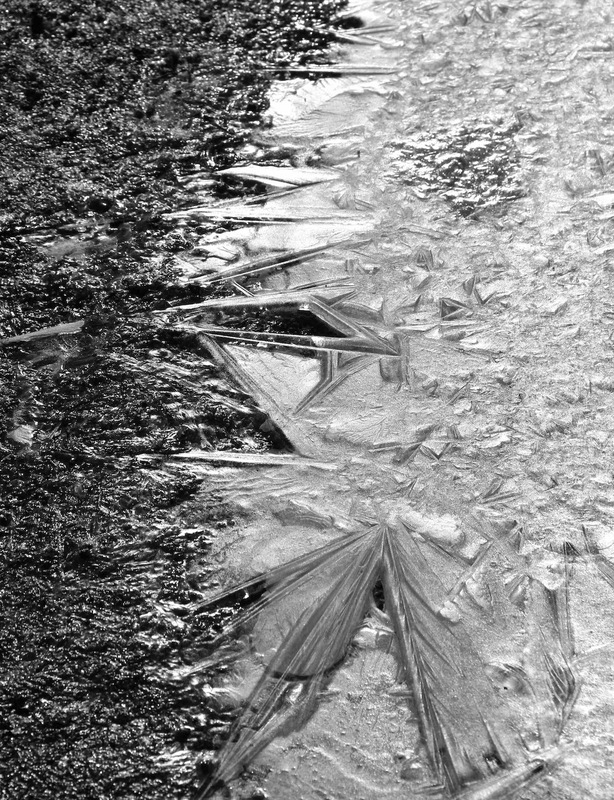 So while others are reveling in greenery and flowers, we have ice art to enjoy. It’s fascinating. 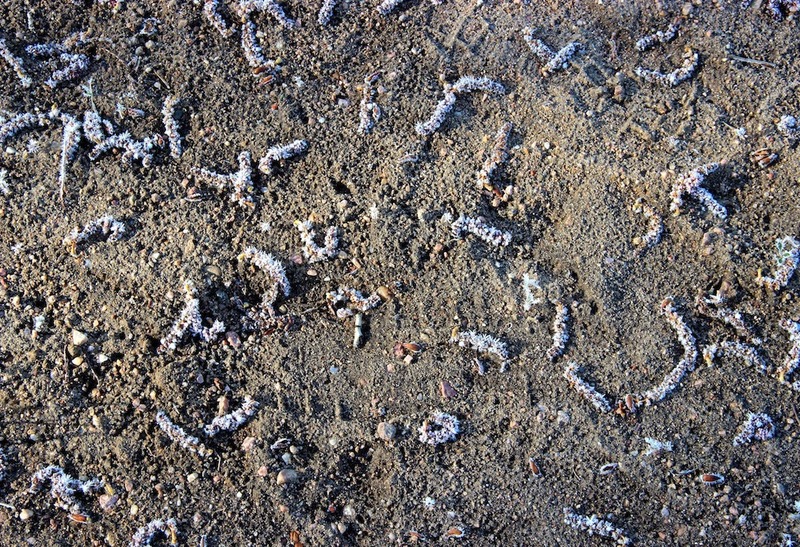 There always are new patterns to check out and photograph. 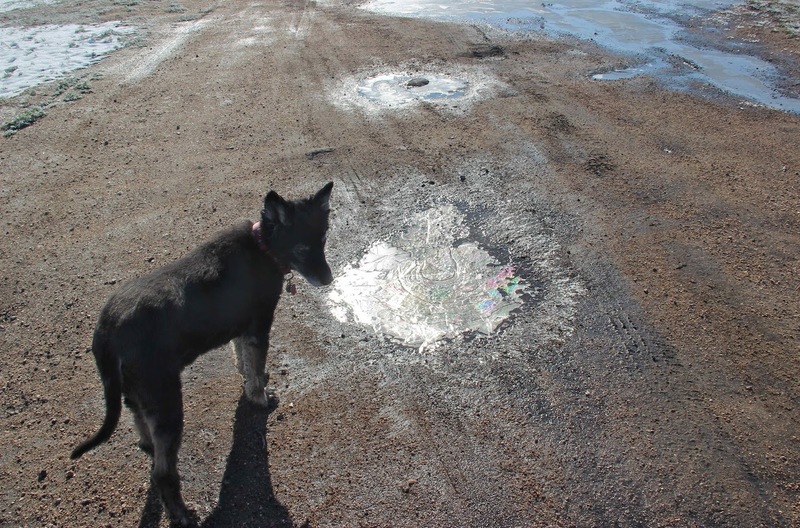 Even mud puddles are intriguing. Our spring plants are tough, and can put up with Jack's doings. His icy decorations won't last long anyway. "No worries, we've been through this before." The cottonwoods still haven't leafed out. 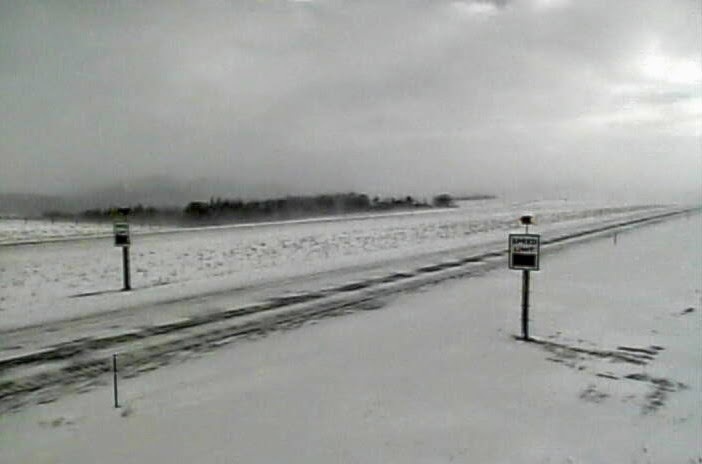 Good thing -- we had 8" of wet spring snow the other day. It would have piled up on leafy branches, probably enough to break some. 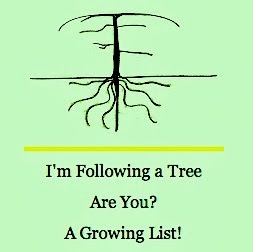 This is the tree I'm following this year -- it's wisely waiting for spring. Recent snow and wind had knocked male catkins off the tops of the trees. 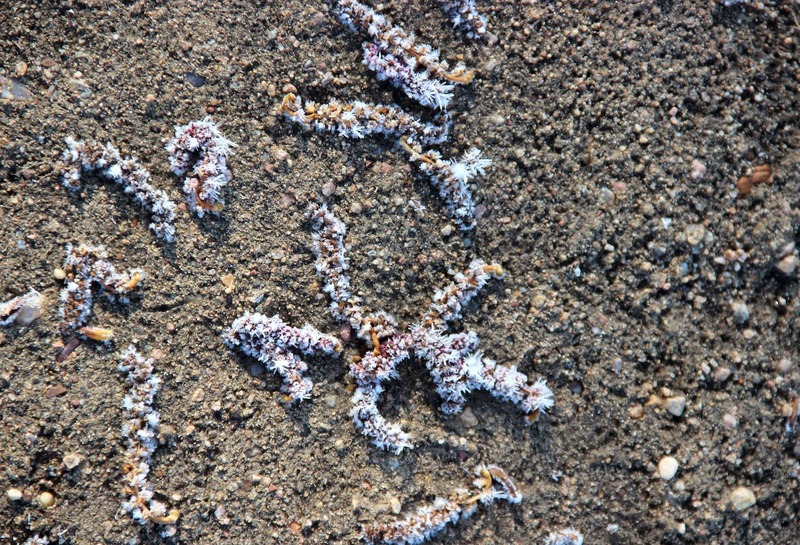 The ground was littered with males ... spent, but pretty in their frosty outfits. Click on images for a better view of these guys. 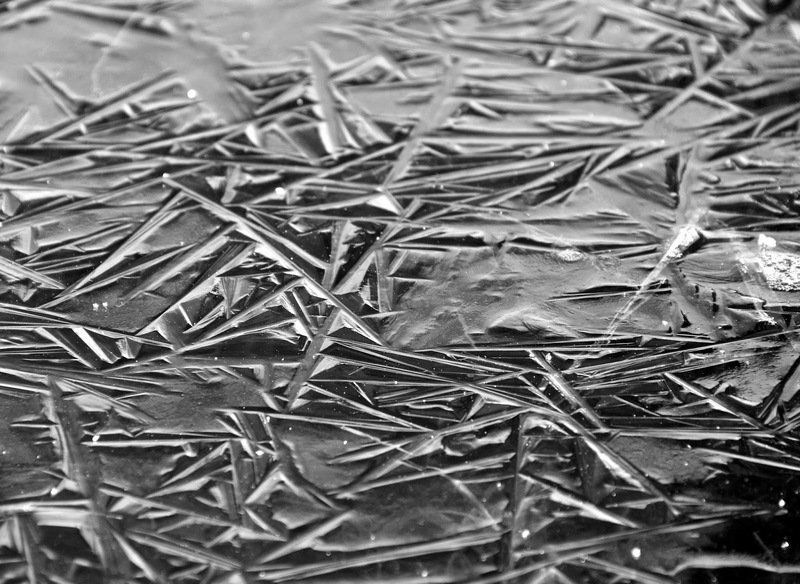 The river was ice-free, but the overflow ponds had frozen on the surface. 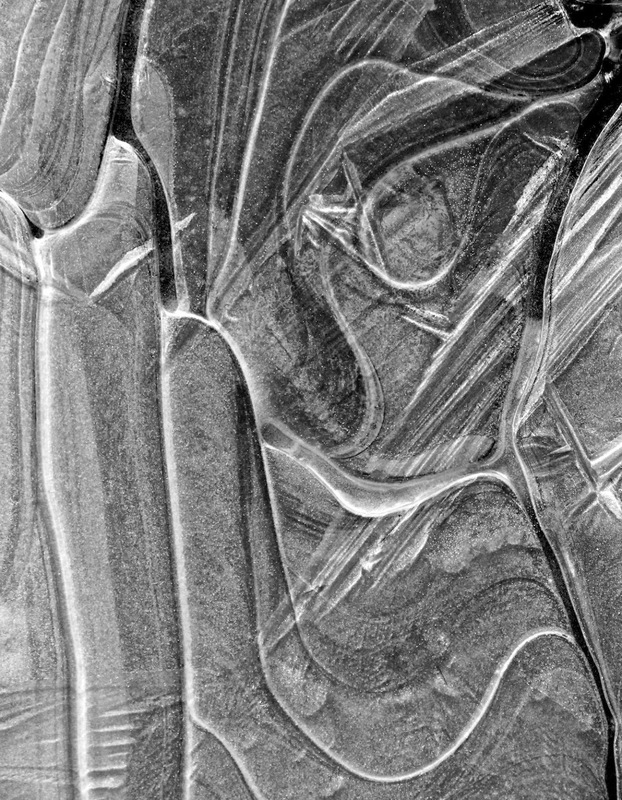 As always, there were neat patterns I hadn't come across before. Indeed, it can take a really long time to walk just a short distance through an ice art exhibition -- there's so much to see! 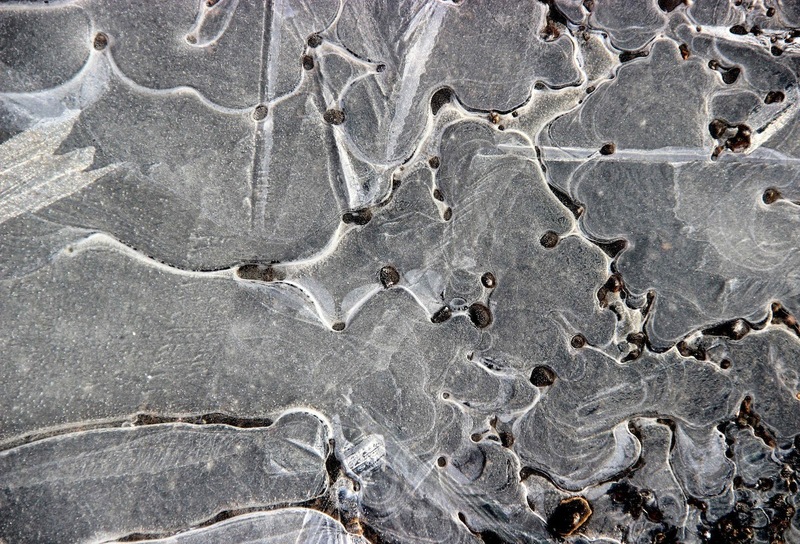 Since my first photographic exploration of ice, Jack and I have worked together a lot. For more collaborative exhibitions, see these posts. From Central Park in Winter by Thomas Nast, 1864. 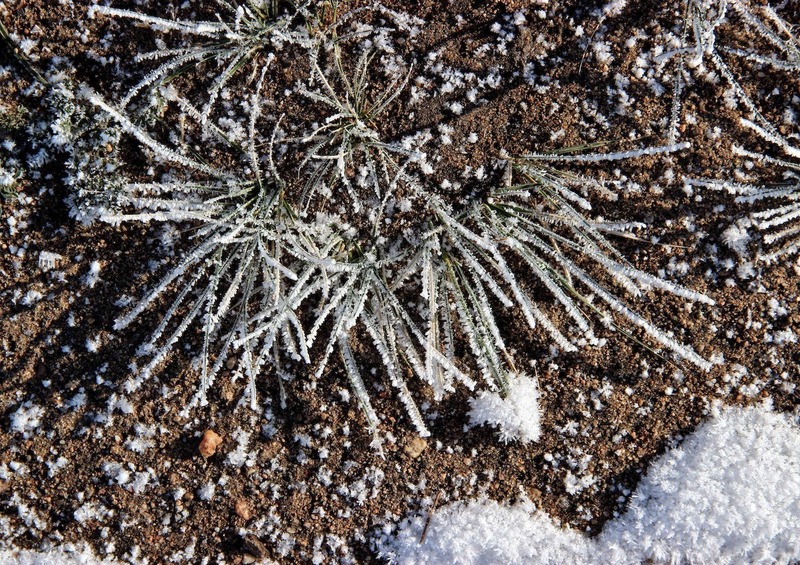 Trees are uncommon in the Laramie Basin; our native vegetation is mostly grass and shrubs. 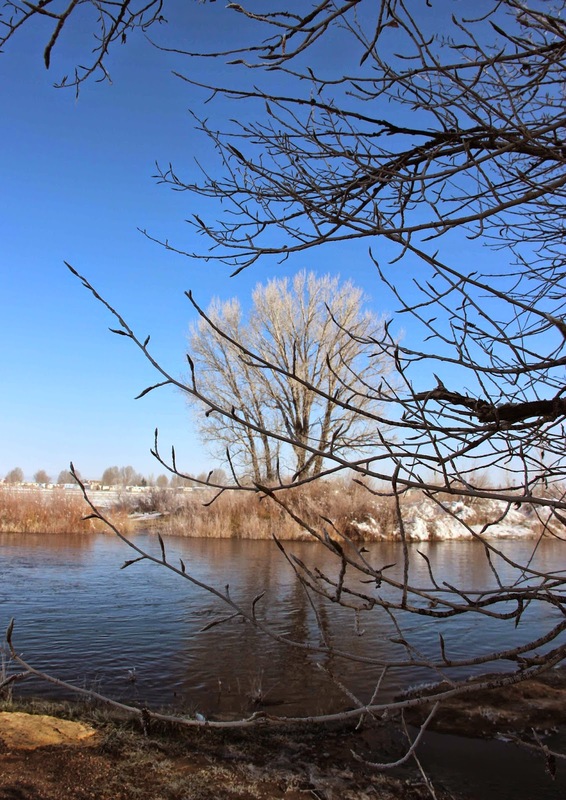 But all along the Laramie River are gallery forests of cottonwoods, so when it came time to pick a tree to follow, that's what I chose. 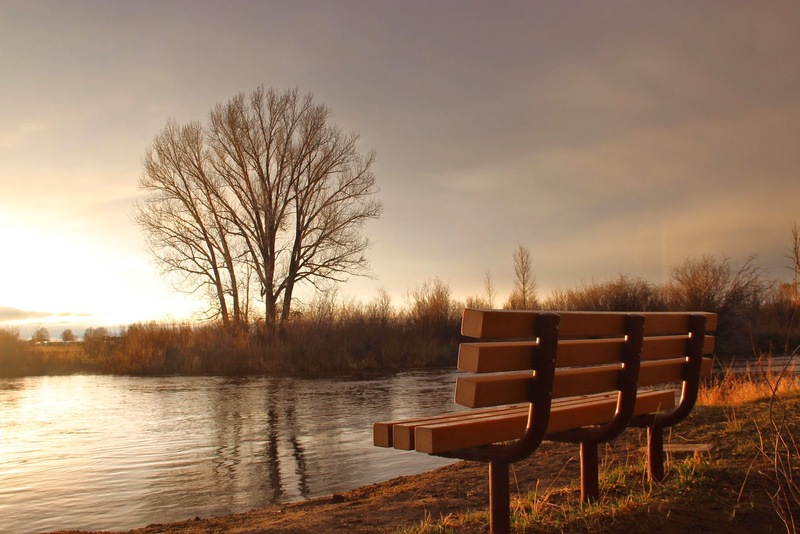 My cottonwood grows directly across the river from Rich’s bench, where I like to sit and watch the evening progress. 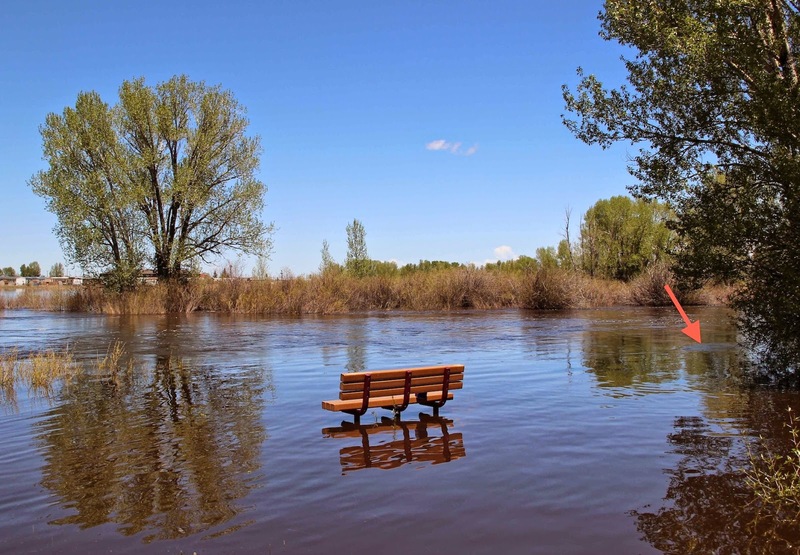 Memorial benches have been strategically placed along the Laramie River. This one honors Rich Koschnitzki. I know this tree is a cottonwood and probably a narrowleaf cottonwood, but I’ve been waiting for spring and leaves before making a decision. Now it’s May and there are still no leaves! If you’re wondering about the first photo -- it’s fake. 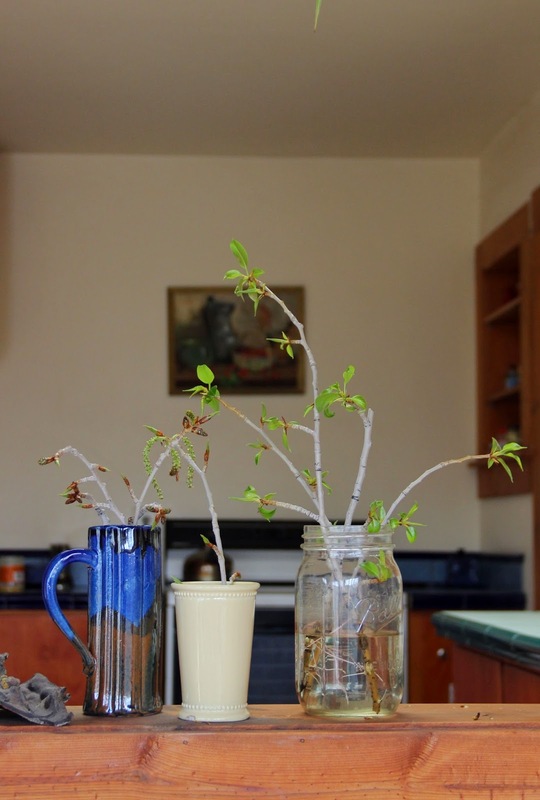 About a month ago I clipped a few bare branchlets from my tree and put them in a jar with water. 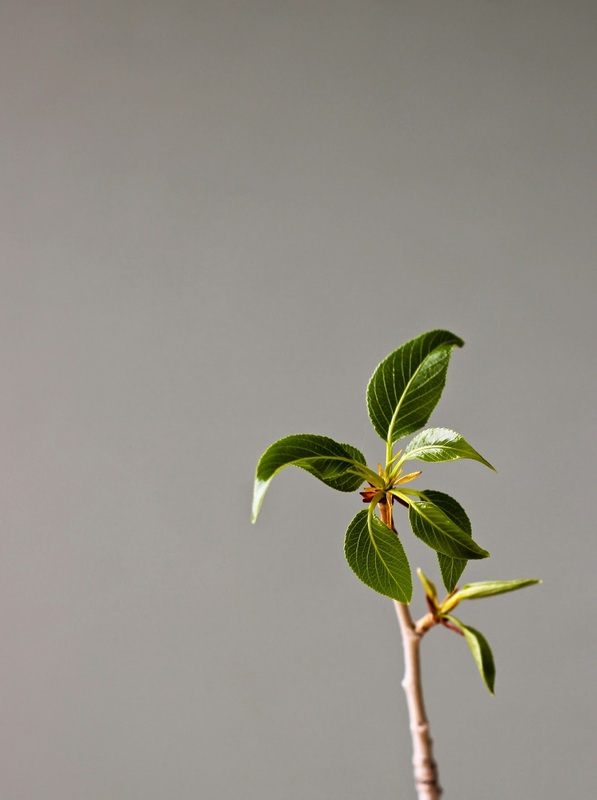 It wasn’t long before young leaves emerged. 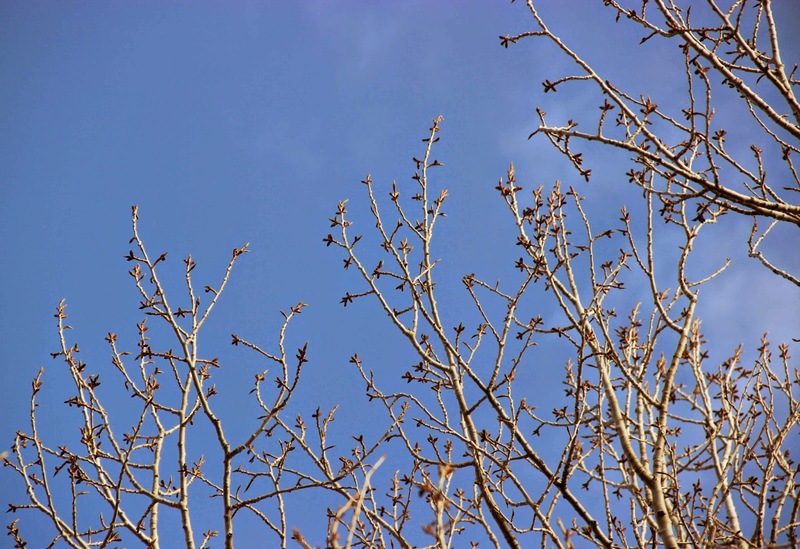 Several weeks ago I noticed that some buds on some cottonwoods were very plump, but unfortunately not on my tree. 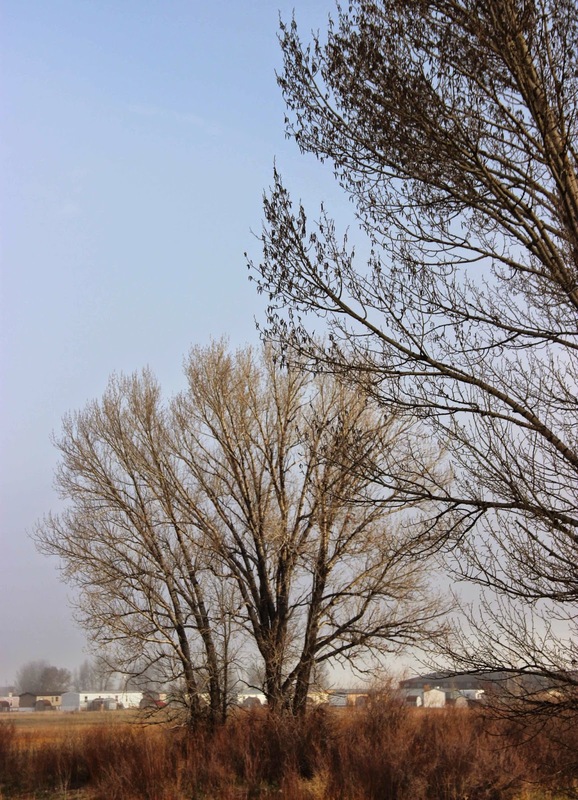 The cottonwood on the right has fat buds and even young catkins; mine (center) does not. I clipped a few branchlets from the tree on the right above and took them home. 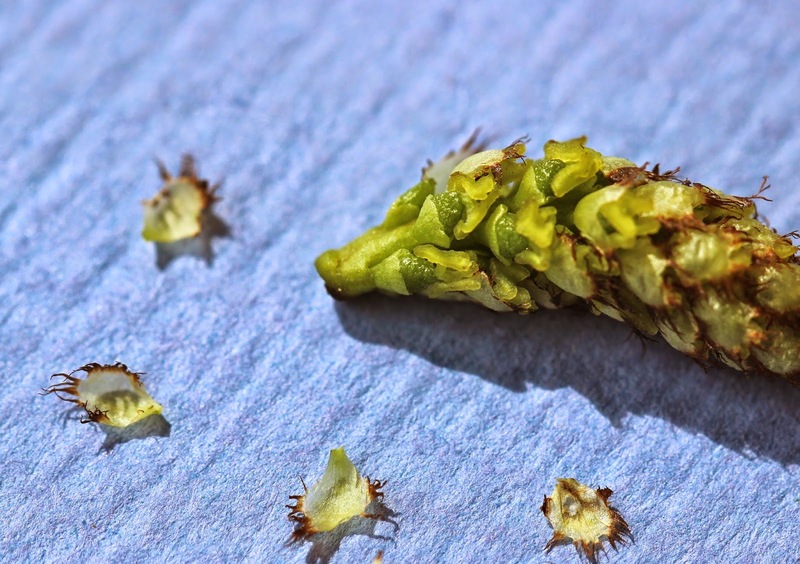 Leaf tips soon emerged from the slender buds and out of the plump ones came female catkins (flower clusters). 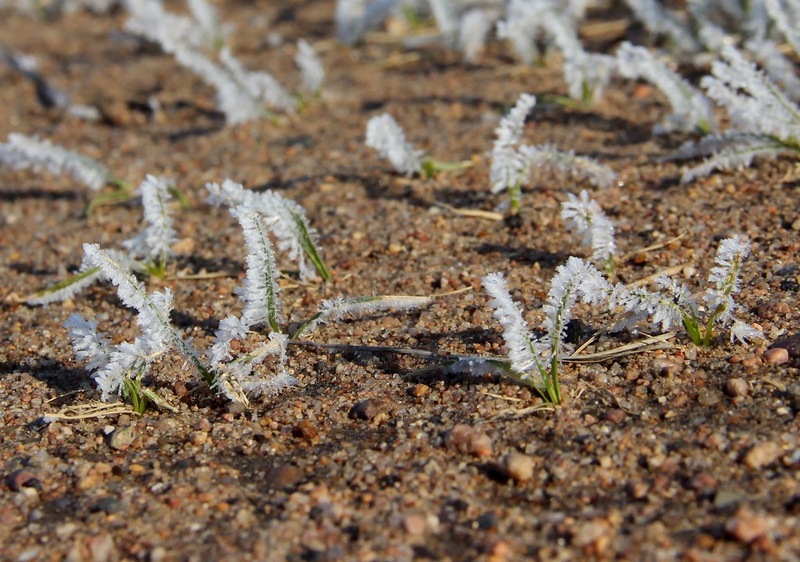 Cottonwood flowers aren’t much to look at. They’re tiny and have no petals. But they do have reproductive structures and that's what counts. A female cottonwood flower is simply a pistil sitting on a cupped disc. 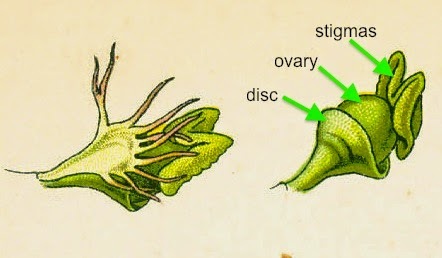 Seeds will develop in the ovary after fertilization. 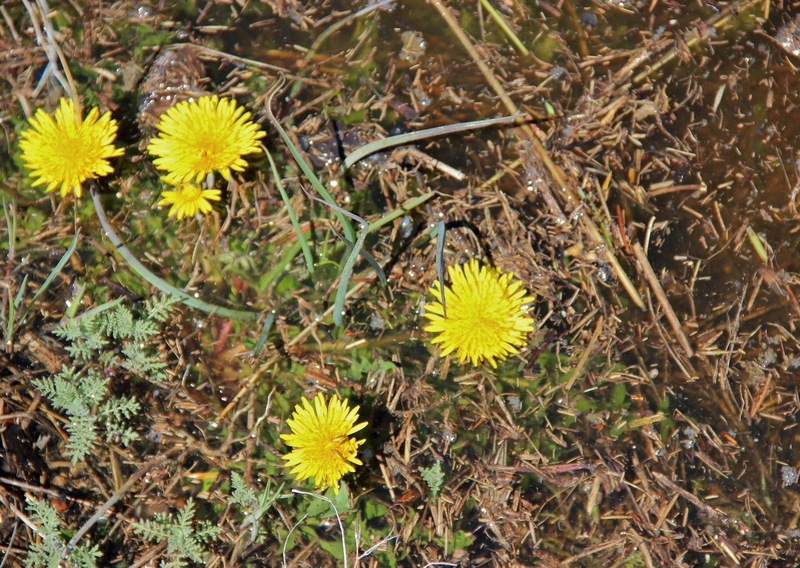 Female cottonwood flowers; the one on the right has the floral bract removed (Kohler's Medicinal Plants). 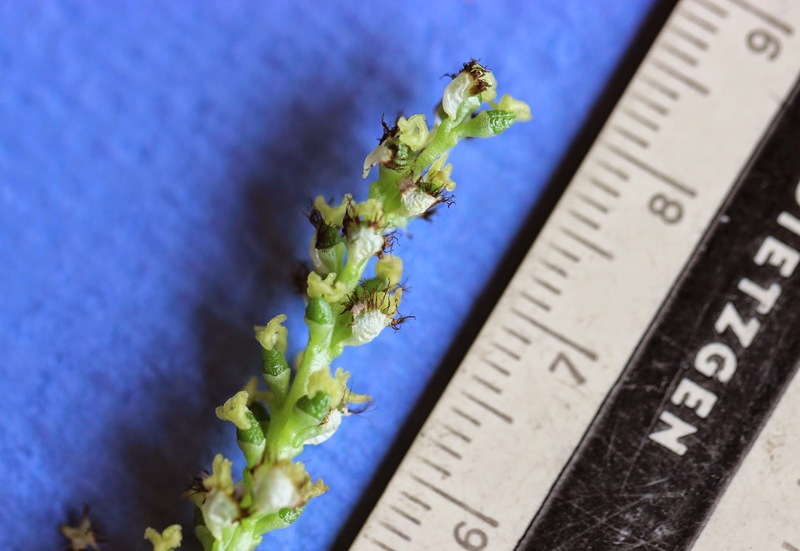 If you click on the image below, you'll see green pistils sitting on pale green discs. 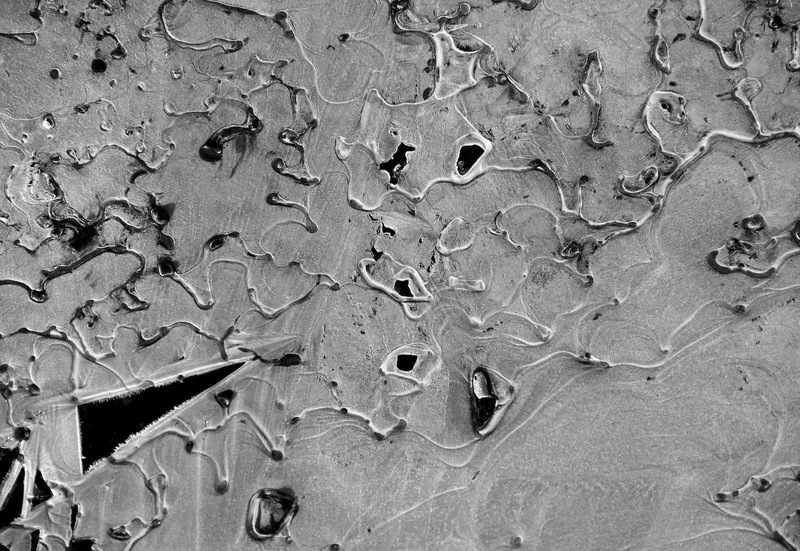 Their stigmas are the yellowish structures at the tip. Scale is in centimeters. Then just a few days ago I noticed that my tree had two kinds of buds, including plump ones (below). This was great news! I wanted to collect some of course, but they were all out of reach. Yesterday I found a long stick on the ground by the tree. I pushed through the willows to where I could hook and pull down a branch and get a few plump buds. There were catkins peeking out of them. What do you think ... guys or gals? 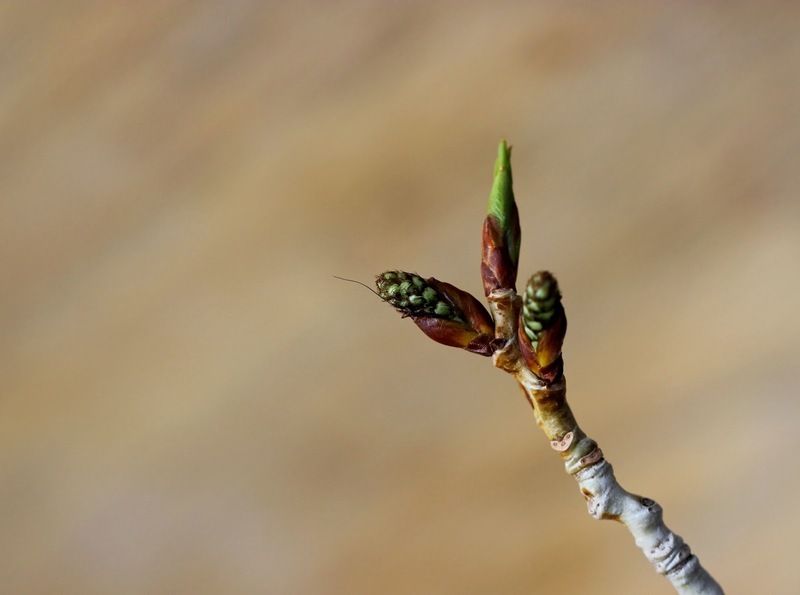 A leaf bud and two flower buds from my cottonwood tree. Cottonwoods have male and female flowers on different trees (dioecious). 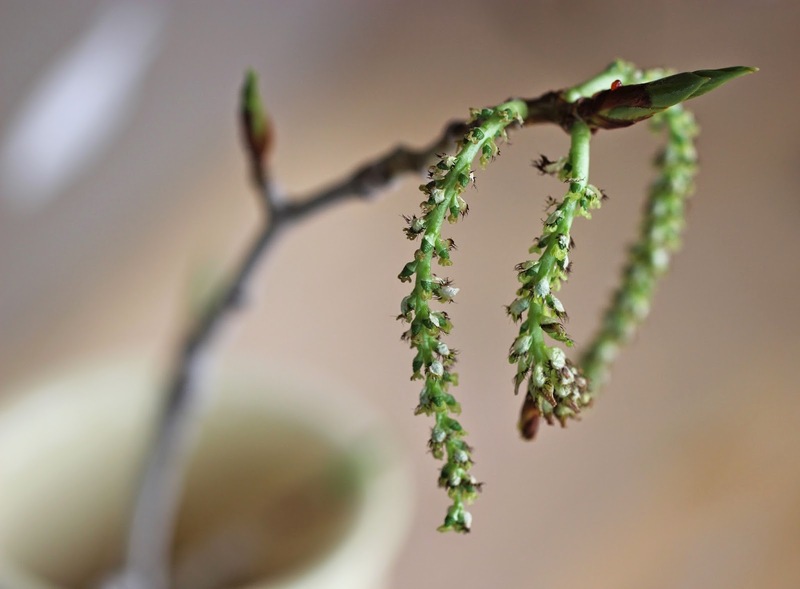 Since the female trees were already blooming, I was tempted to think the plump buds on my tree would produce male catkins. But I’ve learned not to jump to conclusions. Plants have fooled me before! ... little green pistils sitting on cupped discs. Turns out my tree is female too, but she’s a late-bloomer. So where are the guys? I don't know, haven't seen any yet. Maybe I'll be able to answer that question next month. There's a gallery forest in the kitchen! Many thanks to Lucy for getting us going on these adventures. 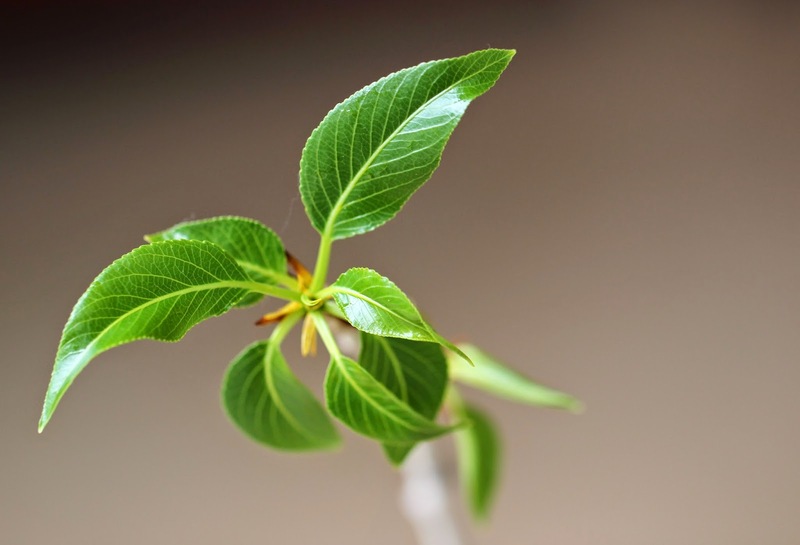 Check out the latest news about our trees.